Recently I asked my mom if she would knit a grey scarf for me... check out this lacey, scalloped-edged alpaca beauty she made! I love love love it. Edited 12/8/07: The pattern for this scarf can be found HERE. My mom is an excellent sock knitter, I wear her creations all winter. This pair, Monkey from Knitty, is the newest member of the rotation (I am wearing these with my new lounge pants in the previous post). 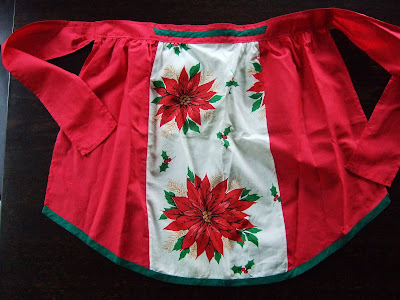 What timing - a Christmas apron! This is a recent find from a Goodwill in Colorado. I like how the person who made it stitched some of the green bias tape in the center of the band, just for decorative purposes. This is my most recent completed project. Catnip toys! Every December at work, my group holds a day-long sale of books, baked goods, crafted/donated items, etc, and the money raised is given to a local food bank. The first year I was at this job, I made some cat toys, and that has been "my thing" ever since. You've been spoilt! I love the scarf and the socks, congrats to your mum. Beautiful gifts from your Mom! This scarf is exquisite. You have a super Mom! I hope the catnip toys sell quick! Great idea for a fundraiser. That scarf is beautiful and those socks look so comfy. I can't wait to really start knitting. Those catnip toys are cute! what a neat gift. love the socks. Can your mom adopt me???? Love the scarf and socks. The apron is adorable! I have been on an apron kick recently. 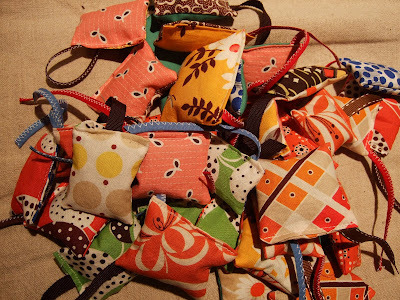 The catnip toys are a fun idea and what a great idea for a fundraiser. I work in an office with all men so that idea wouldn't fly for us. I recently suggested a pot luck lunch (with everyone contributing something) and they looked at me like I was an alien. "Umm, or maybe we can just get pizza." Hey, I've been wanting a grey scarf too. Can you pass this note along to your mom. It's gorgeous. GO Mom! 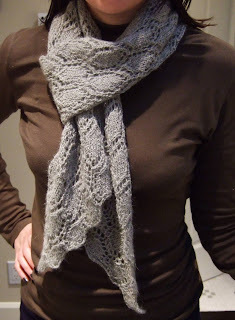 She didn't just knit you a scarf -- that thing is mighty stylish! Oh will your mom adopt me? Gorgeous scarf and socks! Gorgeous... which pattern did she use? I can see talent runs in the familiy. She is amazing!!! 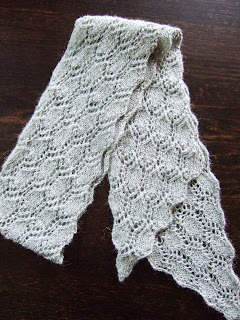 This gorgeous scarf made me order some wool and download the pattern yesterday. Thank you! 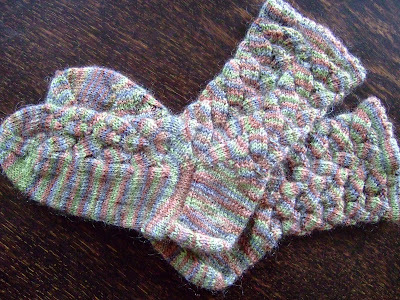 How I wish my mom knit. That scarf is so pretty and the socks look beyond cosy. And the cat nip toys are so cute!